The Caterpillar DP50N LPG forklift is built tough to handle the demands of heavy duty lifting applications. Boasting a tough six cylinder engine which comprises a pre combustion chamber allowing each cylinder to work at optimal peak performance regardless of load and speed. 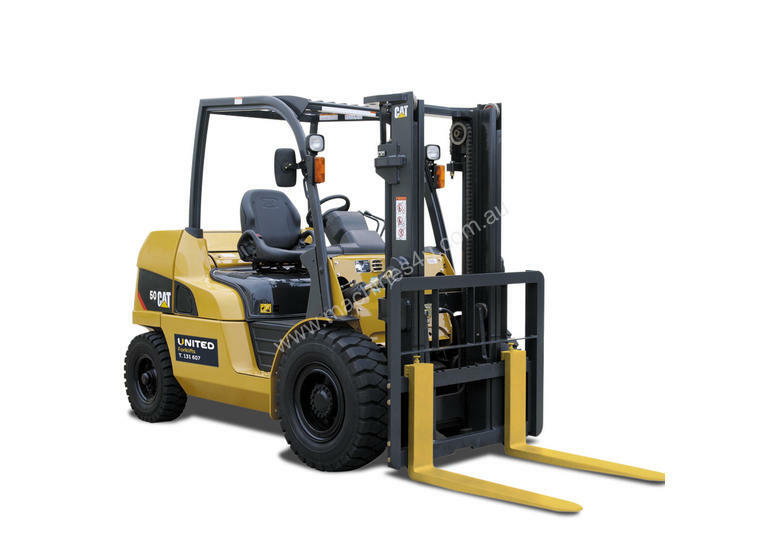 This contributes to the forklifts excellent fuel economy and lower emissions, noise and vibrations. This Cat forklift is ideal for heavy duty lifting in ports, freight, construction, metal and brick operations. The forklift includes an adjustable full suspension contoured seat with lumbar and forward and backward adjustment for maximum operator comfort. The spacious cabin provides a neat and obstructed environment with well-placed controls and advanced ergonomics which effectively reduces operator strain and fatigue.